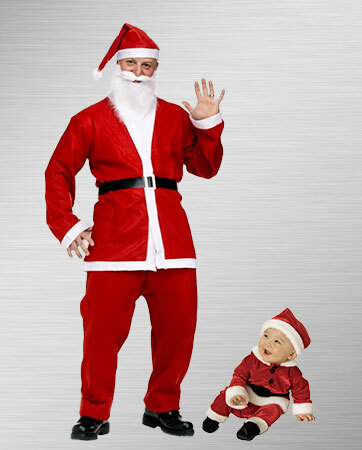 Shop Professional Santa Suits, Christmas-Santa-Elf-Reindeer Party Store For Party Supplies Online. 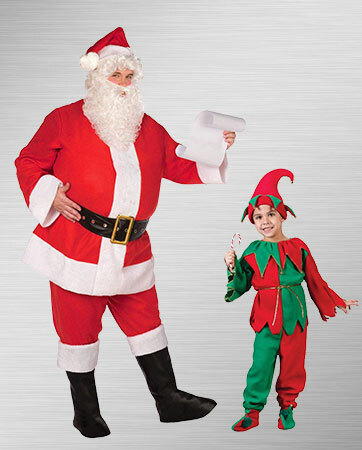 Featuring-Christmas-Santa-Elf-Reindeer Party Supplies And Christmas-Santa-Elf-Reindeer Costumes. Santa Accessories, Santa Beard And Mustache, Santa Beards And Wigs, Santa Boots, Santa Christmas Sweater, Santa Eyebrows, Santa Footwear, Santa Hats, Santa Kris Kringle Suit, Santa Round Glasses, Santa Shirts, Santa Suits, Santa Tuxedo, Santa'S Helper, Buddy The Elf, Christmas Bunny, Christmas Elf, Christmas Reindeer, Christmas Sweater, Elf And Helpers, Elf On The Shelf, Gingerbread Man, Green Elf Shoes, Grinch, Jovi Elf, Light-Up Chanukah Sweater, Mrs. Claus, Mrs. Claus Dress, Mrs. Claus Suit, Reindeer Suit Rudolph The Red Nose Reindeer Suit, Scrooge, Sitting Elf, The Nutcracker, Toy Soldier, Traditional Mrs. Claus, Wooden Soldier, Wooden Toy Soldier. (Christmas-Santa-Elf-Reindeer Party Supplies Plus Costumes) 5' Inflatable Santa With Bag (1) Bring In The Holidays With This Friendly 5' Inflatable Santa With Bag. Includes Inflatable, Adapter, Blower, (4) Leeds, (7) Lawn Stakes, And (3) Ropes. (Christmas-Santa-Elf-Reindeer Party Supplies Plus Costumes) Majestic Toy Bag (1) The Toy Bag Is Made Of Burgundy Pile Plush With A White Drawstring. The Bag Is 36" Tall X 29" Wide. (Christmas-Santa-Elf-Reindeer Party Supplies Plus Costumes) Plush Santa Hat Adult Costume. (Christmas-Santa-Elf-Reindeer Party Supplies Plus Costumes) Round Eye Glasses Clear #24906 Adult Costume. (Christmas-Santa-Elf-Reindeer Party Supplies Plus Costumes) Round Glasses #3860 Kid's Costume. (Christmas-Santa-Elf-Reindeer Party Supplies Plus Costumes) 60" Climbing Santa (1) | Package Includes: (1) Hang Able Climbing Santa. (Christmas-Santa-Elf-Reindeer Party Supplies Plus Costumes) Adult Santa Accessory Kit-One-Size | This Costume Includes: Deluxe Santa Wig, And Beard With Attached Mustache. One-Size Fit's Most Adults. Does Not Include-Hat, Glasses, Gloves, Or Costume. No secular Christmas celebration is complete without Santa Claus. Kids and adults alike eagerly await his visit--probably more because of what he brings than for himself. Everyone wants to find out what’s in that great big sack! 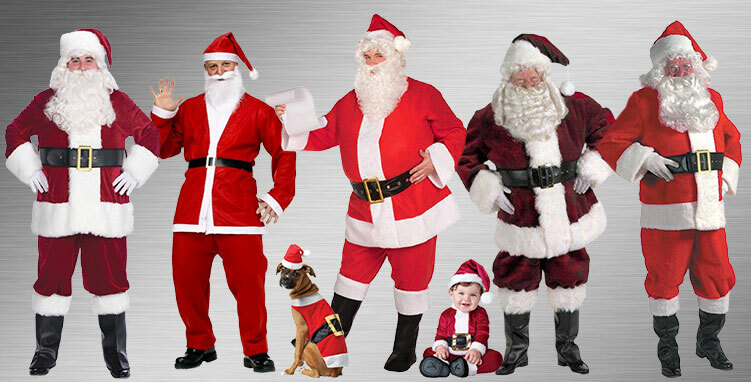 Our Santa Claus costumes range from printed T-shirts and hoodies to the full velvet suit with faux fur trim. And we have sizes from infant through adult plus. Then we have accessories, too. A sack to carry all those gifts. Black boots with faux fur cuffs. Wigs and beards. 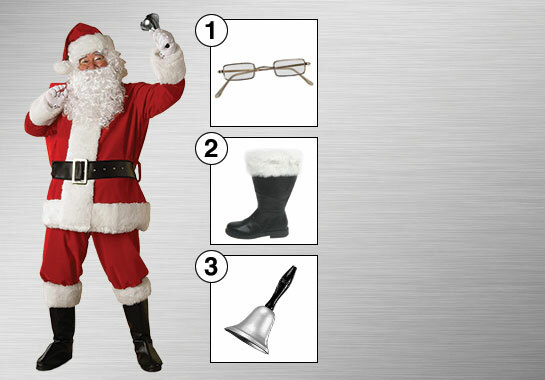 Everything you need to become a convincing Santa Claus. Whether you picture Santa as the early Christian Saint Nicholas or as Clement Moore’s jolly old elf, we have a costume for you! Are you looking to be the jolliest St. Nick anyone has ever seen this Christmas? Well, you can’t be the best without this Premiere Santa Suit! We made it right here with the same amount of love and care Santa’s helpers put into the wonderful toys they make for all the boys and girls in the world. Once you slip into this fantastic costume you’ll be ready to help make children’s dreams come true. Every kid hopes of one day sneaking up on Santa the night before Christmas and seeing him put the presents beneath the tree. Well now with this premier costume, you can help children all around the world finally meet the big man in red. One thing that every child wants is to be heard and when they have Santa listening to the Christmas wish list it will be a dream come true! Children are also very curious so you’ll want to make sure your North Pole knowledge is on point. Also, coming up with a few funny anecdotes about the elves and reindeer wouldn’t hurt. Remember if any of the kids ask who gives you the best tasting cookies that you tell them it’s Mrs. Clause. One because that’s what the real Santa would say and two because that will prevent any jealousy from starting amongst the crowds of children. Ho! Ho! Ho! 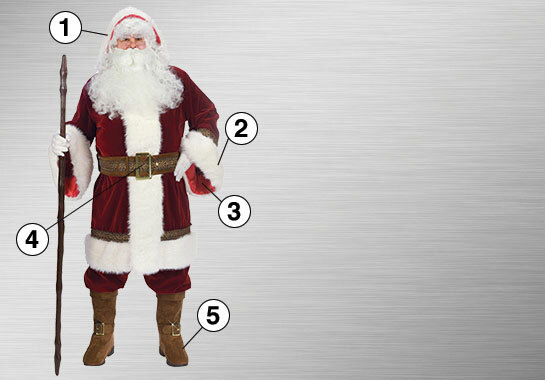 This Premier Santa Suit has everything you’ll need to make a truly memorable Christmas. All you need to complete the transformation is an amazingly fluffy white beard. So either start growing yours out now or take a look at the selection of beard accessories we have available. Are you behind-the-scenes magic maker of your household? Do you love baking cookies and other goodies? Have penchant for serving hot cocoa to your hubby after a long night of work? Then you have a lot in common with the first lady of the North, Mrs. Claus! Mrs. Claus is the unsung hero of the North Pole – always making sure that Santa Claus has everything he needs in order to get the toys delivered to the children of the world each year. Though we don’t talk about her much, she keeps the machine that is Santa’s Workshop rolling smoothly at all times, and we should celebrate her just as much as we celebrate Santa each Christmas! If you are getting ready for a holiday gathering and want to impress your guests, this Mrs. Claus costume is the perfect way to upstage even the big man himself! Whether it’s to complement our Santa Claus costume or to fly solo, you'll love the rich details on this Deluxe Classic Mrs. Claus Costume! It’s edged with luxurious faux fur, with gold embroidery. It’s perfect for serving Santa his cocoa and cookies before his big Christmas delivery trip. The 100% polyester crushed velvet and faux fur give this dress a classic holiday look and the fur edging at the collar, cuffs, and hemline give it a warm look that Mrs. Claus surely needs in the North Pole! The velvet capelet and matching hat add the final touches to this traditional Mrs. Claus costume – perfect for plays, holiday parties, and family gatherings. You can’t have Christmas without three essential things: egg nog, cookies, and Santa Claus. But Santa couldn’t do his job without his helper elves working their magic! Dress up as one of the real heroes of the holidays in our exclusive Holiday Elf Costume, and enjoy the festivities in style! The life of a holiday elf has got to be cheerful and full of magic. They get to live in the North Pole, make toys, and their boss is a jolly old fella who drives a flying sleigh, for crying out loud! But we'd bet it’s also extremely hard work, especially when it gets close to Christmas, and the pressure of deadlines starts weighing on them. And it’s probably not like elves get to play with all of those toys they've been making (they are at work, after all), and as jolly as Santa seems to us, he probably gets a little grouchy when he’s trying to get those last minute preparations in order. But that doesn’t stop all the elves from throwing a huge party the day after Christmas to unwind before work for the next year starts, and we bet nobody parties as hard as an elf after the holidays! 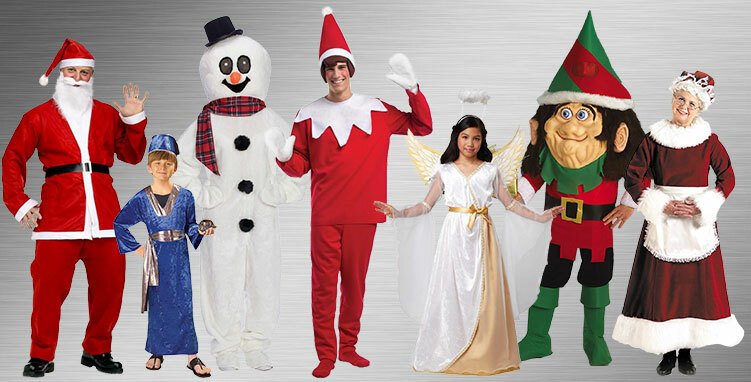 You can party as hard as an elf, too, in our fun and festive costume! It comes with everything you'll need to look Christmassy at your holiday parties (or to confuse everyone at a Halloween party). We also make this in kids and toddler sizes, so your friends and family can spread some seasonal spirit together! And definitely don’t forget the cookies and egg nog... It’s that time of year where we all want to get together and make memories that will last. The weather turns colder, in some places the snow starts to fall, and the city brownstones and the country hillsides both become illuminated in the night’s darkness. It’s the kind of thing that plucks at the nostalgic tethers of your heart strings, makes you want a nice cup of hot cider, and to sit back and enjoy a roaring fire beside a beautiful tree with all the trimmings. It also makes you want to... party! The Holiday party is always one of the best. Ugly Christmas sweaters. Santa suits. Elves with pointy elf ears. Mysterious, wrapped presents. Egg nog (okay, maybe not the egg nog) and everything else that makes Christmas the best time of year! Don’t let another season go by without a celebration for the ages (and the best of social media posts). 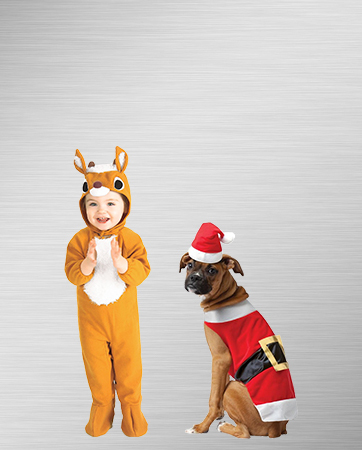 Get a Christmas costume! We have so many that you must check it out because after that you'll be on your way to making your season as merry and bright as can be. Ho Ho Ho, and away we go! Being a deer? It’s never easy... First, you have to watch out for hunters, because they are all too eager to add you to their trophy wall. Second, you have to deal with all those people who keep confusing you with a reindeer. Third, all young deer have to figure out who they’re going to be when they grow up. So what’s a good deer to do? Just prance. Study and refine your techniques. Prance like you've never pranced before! Interpretive prance! Break prancing! Modern prance! Swing prancing! You must do it all to make it and you can’t let any of those haters get you down. Doe you, young deer. Doe you.